2017 was a record year for both store closings and retail bankruptcies. 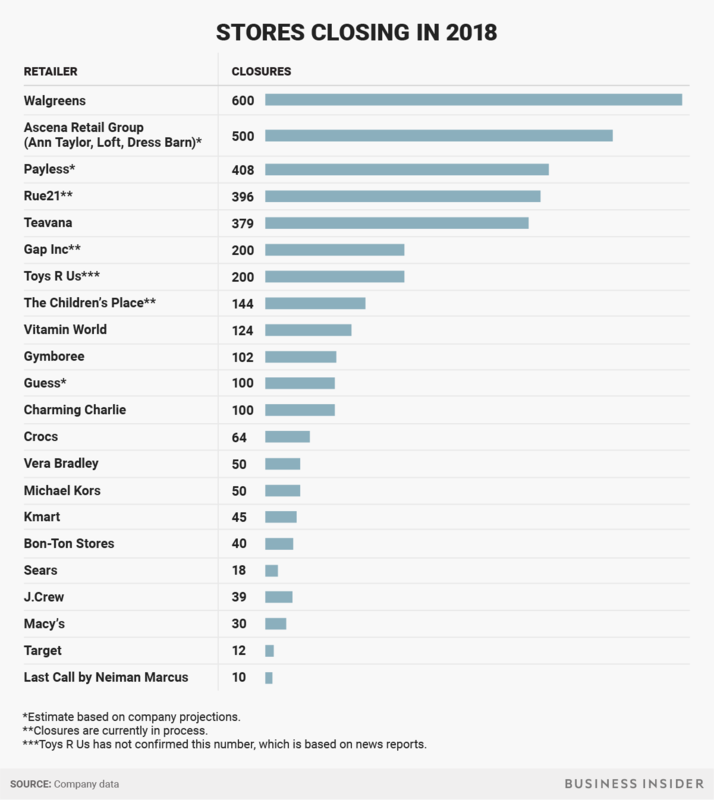 Dozens of retailers including Macy’s, Sears, and JC Penney shuttered an estimated 9,000 stores — far exceeding recessionary levels — and 50 chains filed for bankruptcy. But there’s still a glut of retail space in the U.S., and the fallout is far from over. The number of store closings in the U.S. is expected to jump at least 33% to more than 12,000 in 2018, and another 25 major retailers could file for bankruptcy, according to estimates by the commercial real estate firm Cushman & Wakefield. The commercial real estate firm CoStar has estimated that nearly a quarter of malls in the U.S., or roughly 310 of the nation’s 1,300 shopping malls, are at high risk of losing an anchor tenant. Anchor tenants are retailers like Macy’s and JC Penney that occupy the large, multistory buildings at mall entrances. That’s good news for retailers looking to grow their physical assets — it means they are more likely to score low rent and favorable lease terms. But it’s terrible news for retail landlords, some of whom are now trying to stop the bleeding by suing the companies that are closing stores. BITCOIN BLACKHOLE 2/Warning, Where is your Investment! !